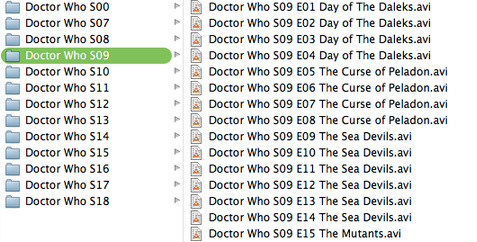 As alluded to in a previous post, I had a right oul’ palaver at the weekend, trying to name my Doctor Who episode collection in such a way that XBMC would catalogue them properly. In retrospect, it may seem pretty obvious but, at the time, I thought I’d have to do some form of sub-organising within seasons to account for the distinct stories in each one. Turned out you just number the episodes in order, starting from episode 1, for each season, and give all parts of the same story the same name. 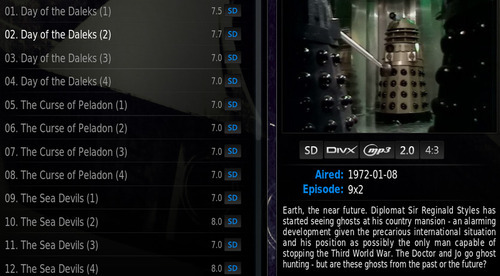 XBMC then correctly lists them as multi-part stories. Posted here in case it helps anyone else in a similar bind. As I said, I wasn’t able to find the answer on the intarwebs and arrived at it through trial-and-error. BTW –if, as I did, you ever find yourself with eleventy billion files to rename, I highly recommend A Better Finder Rename, a splendid wee app which makes the process *almost* painless.